At the 2013 Los Angeles Auto Show, Subaru unveiled the Legacy concept, which previewed the sixth-generation model of the company’s already familiar mid-size sedan. The production model arrived at the 2014 Chicago Auto Show with a completely revised exterior, and updated interior, and a revised engine lineup. Redesigned from the ground up, the Legacy’s outer shell is sportier thanks to its coupe-like roof and more aggressive front end. Aerodynamics have also been improved, bringing enhanced performance and fuel economy. The fully revamped cabin brings more legroom than ever before, a larger instrument cluster display, and a new infotainment system. The sedan received upgrades in the drivetrain department as well, and although both engines were carried over from the previous model, the four-cylinder cranks out a bit more horsepower and torque. Will the new Legacy have what it takes to give its competitors a run for their money? Keep reading to find out more about that. Updated 05/06/2017: Subaru announced that for the 2017 model year, the Legacy will receive a new “Sport” trim level. Continue reading to learn more about what it brings new to the lineup. 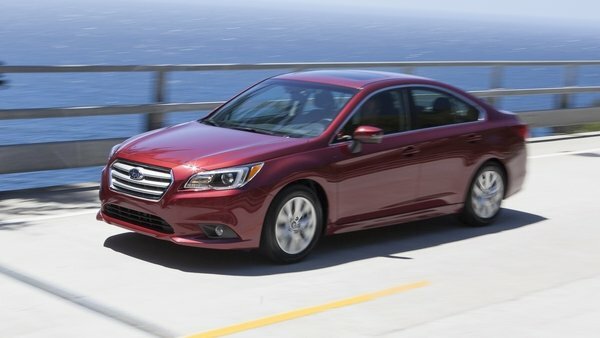 Continue reading to learn more about the Subaru Legacy.